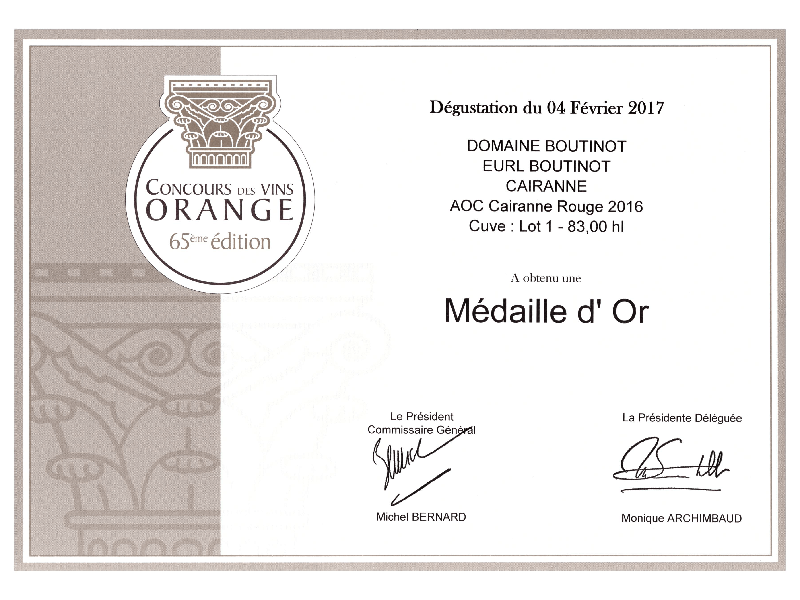 Judges at the 65th Concours des Vins à Orange have awarded Cairanne AOP 2016 from Domaine Boutinot a Médaille d'Or (Gold Medal). Cairanne was granted Cru appellation status, the same classification as Gigondas, Rasteau and Châteauneuf-du-Pape, in June 2016. All the Cairanne vineyards of Domaine Boutinot, Rhône fell within the newly defined Cru map. The Concours des Vins à Orange was set up in 1952 to assess the quality of wines in the Rhone valley. Judging procedures are rigorous, with samples collected directly from each cellar and tasted blind by a panel of judges selected from the wine trade. This award is the first impartial assessment of the quality of 2016 Cairanne AOP classified wine from Domaine Boutinot. Currently maturing slowly in barrel until the final assemblage - destined for Les Six 2016 - is selected, this early positive review suggests cru classified Cairanne AOP from Domaine Boutinot will be highly sought after. 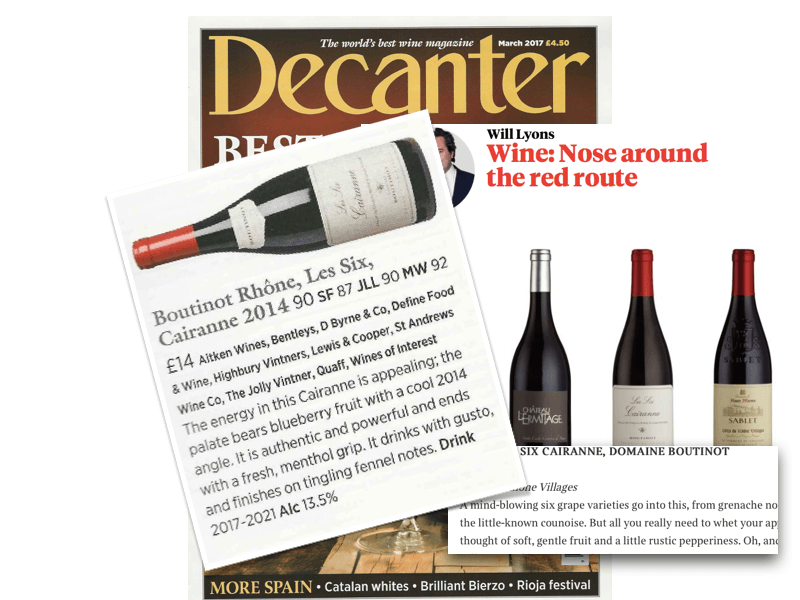 Decanter has awarded 90 Points (Highly Recommended) to Les Six, Cairanne, Côtes du Rhône Villages 2014 in their latest Côtes du Rhône Villages reds panel tasting (March 2017). One of just two Cairanne's to be awarded 90 points judges commented that "The energy in this Cairanne is appealing; the palate bears blueberry fruit with a cool 2014 angle. It is authentic and powerful and ends with a fresh, menthol grip. It drinks with gusto, and finishes on tingling fennel notes." Will Lyons, writing in UK publication The Sunday Times (5th February 2017) also praised Les Six 2014 "A mind-blowing six grape varieties go into this, from grenache noir, syrah and the little-known counoise. But all you really need to whet your appetite is the thought of soft, gentle fruit and a little rustic pepperiness. Oh, and the fact that it will go superbly with roast lamb." Yet to be released, the 2015 vintage of Les Six , which will be the first labelled as the newly sanctioned Cairanne AOP, received 16- points from Jancis Robinson when tasted blind in Octobr 2016. 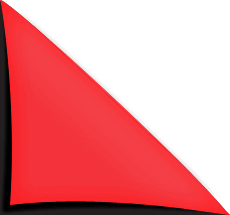 For all reviews of Les Six, Cairanne, Côtes du Rhône Villages 2014 click here.